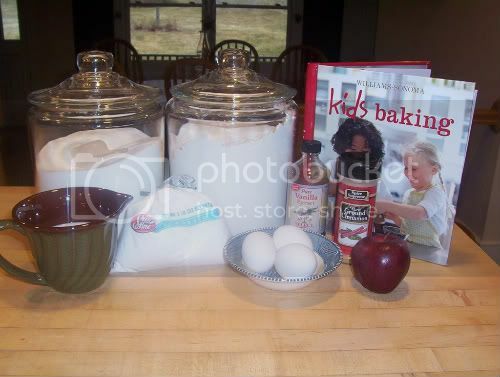 A Teaspoon and A Pinch: Puffy Apple Pancake & Curious Chef Giveaway! Here we are in our second week of cooking with kids. I found this Williams-Sanoma Kids Baking cookbook a couple years ago at our local children's consignment shop. It was a real bargain at $1.99! It is geared for children 6 years and older with reading skills. 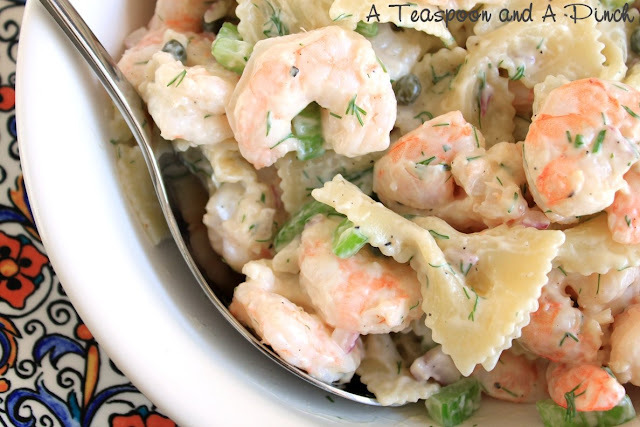 It has beautiful photographs of key steps in each recipe. Seth and I were the first ones up so we thought we'd bake a treat for breakfast and surprise all those still sleeping. 1.) Wash your hands! Preheat the oven to 400 degrees. Grease the pie dish with butter. Curious Chef sent our family their 8 piece cutlery serving set for review. Seth's favorite utensils were the knives and cutting board. He said, "They really cut good!" 2.) Peel, core and cut the apple into small chunks. 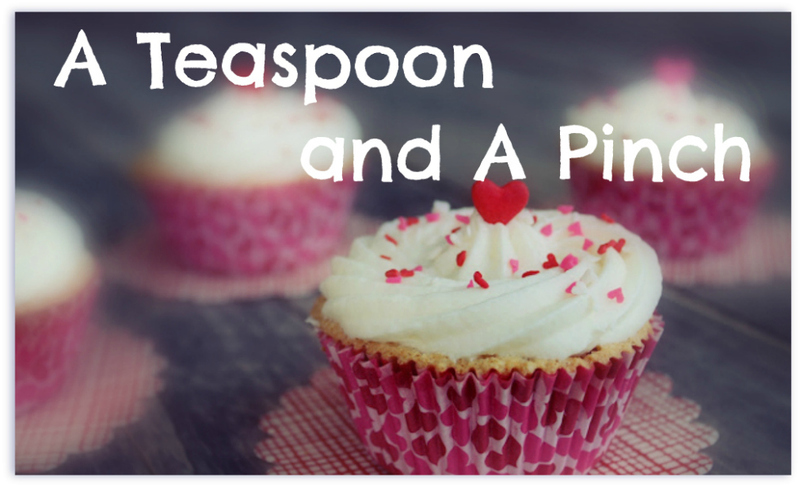 In a small bowl, stir together 2 Tablespoons of sugar and 1/4 teaspoon of cinnamon. 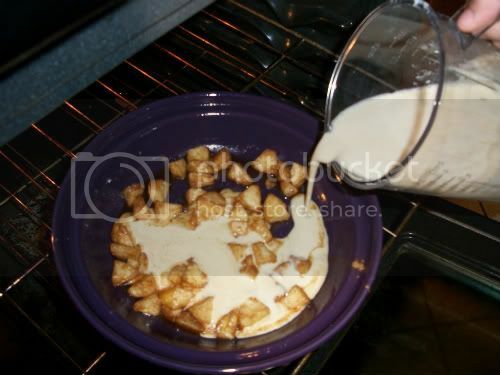 Add the apple chunks and toss until the pieces are evenly coated with the cinnamon-sugar. 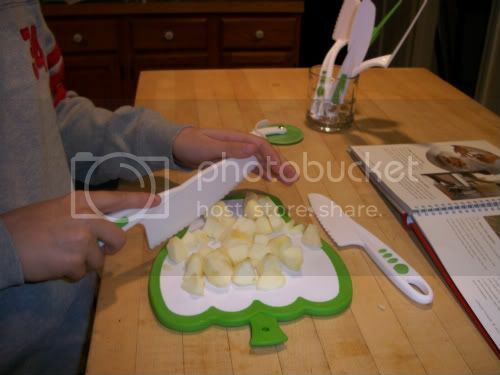 Pour the apple chunks in to the prepared dish, spreading them out evenly. Set aside. Put the lid on securely and, holding the lid down tightly, blend on medium speed for about 1 minute until all the ingredients are well mixed and frothy. 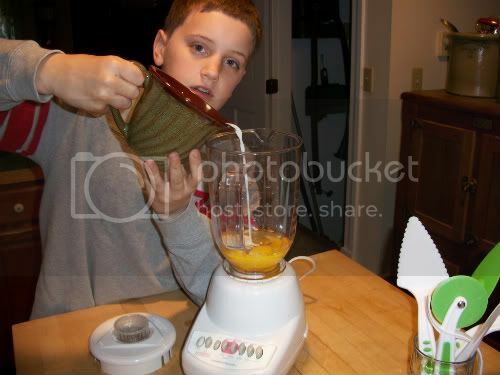 If there's one tool in the kitchen 11 year old boys like to use , its the blender! Seth found the flat edge of the spatula handy for leveling off the cups of flour. Put the dish in the oven and bake the apple chunks for 5 minutes. 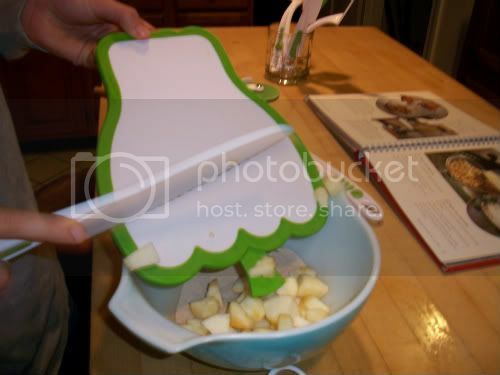 Using an oven mit, carefully pull out the oven rack until the dish is visible. Do not remove the dish. 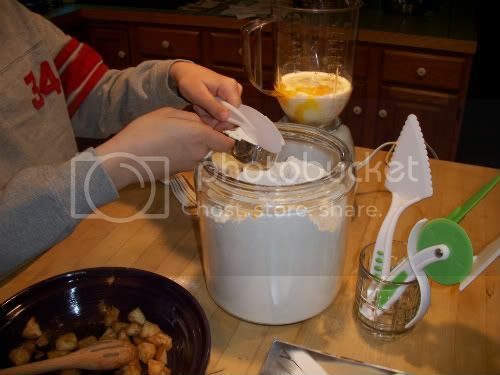 Pour the batter evely over the apples. Slide the rack back into the oven and close the oven door. 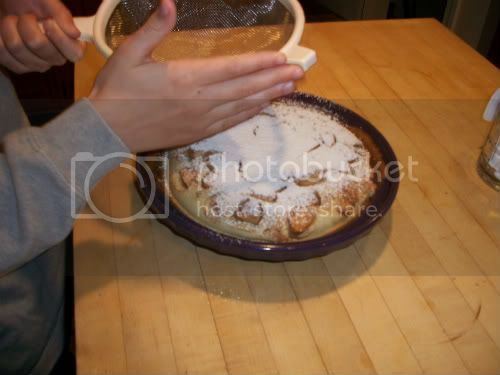 Bake the pancake for about 25 minutes, until puffed and brown. Using oven mitts, carefully remove the dish from the oven and set it on a cooling rack. The apple-cinnamon smell brought them down for breakfast. 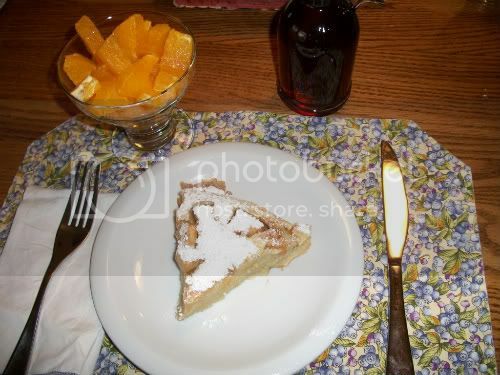 We serve it with pure maple syrup and fresh oranges. Yum! "Our products coupled with a favorite family recipe and an adult's love and encouragement can produce the most memorable moments in a young person's life. " Curious Chef was not only generous with my family, they have offered me their 3 piece prep set to giveaway to YOU! 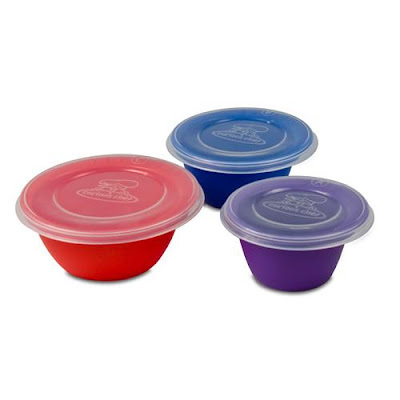 Head on over to Money Saving Maine-iac to enter for your chance to win this fun 3 piece prep set from Curious Chef! that looks easy and yummy! I want those knives now! mmmmm that looks good! Thanks for your sweet comment on my blog. I'm now a follower! We have the pizza set and love the knives. Audrey is two and really loves to have a knife she can use. I am going to have to try this recipe now. Thanks!